How to improve soil fertility | Infonet Biovision Home. In Africa, soil fertility depletion and soil degradation present the most serious problems. According to an FAO study (FAO 2001), African soils lose an annual average of 48 Kg/ha of nutrients, the equivalent of 100 Kg/year of fertiliser. To compensate for this loss, they receive an average of only 10 Kg of mineral fertiliser, compared with a global average of 90 Kg (Spore 1/2). In addition, African soils are generally poor. Maintaining or increasing soil fertility is one of the most important things farmers have to do to increase output. Doing so, farmers have to know the characteristics and constraints of their soils and use sustainable agricultural practices and methods for conserving them and making them more fertile. These include fallowing, using compost, manure, crop residues, fertilizer trees (e.g Calliandra and Pygeum africana), intercropping legumes with cereals and including the principles of conservation agriculture (crop rotation, ensuring permanent cover for the soil and no disturbing of the top soil layer). Soils have to be nourished and cared for, and allowed to rest from time to time. However, the use of fertilizers must consider the chemical properties of local soils, the crops planned and the required output. The local environment must be respected. Farmers should not use ready-made fertilizers that have been designed for other regions. They need mixtures that have been especially formulated to address the deficiencies of their particular soil. For plant growth seventeen elements are essential. They are categorized into macro- and micro- (trace) elements. The macronutrients N, P and K are required in large quantities. Sources of plant nutrients include soil reserves (from weathering of rocks), crop residues,as well as organic and inorganic fertilizers that are added to the soil during the growing season. In order to make a decision on which type of fertilizer to use, a number of observations or tests are needed. For farmers observations of crop growth and the plentifulness and dominance of a particular weed or grass may show which nutrients are deficient. For example, the weed striga grows in infertile soils and is suppressed when applying fertilizers. For a more accurate identification and quantification of the nutrients in the soil, tissue and soil tests are necessary. Generally, dark-coloured soils are assumed to be fertile and high in soil organic matter. Soils with a loamy texture are also assumed to be more fertile than sandy soils. 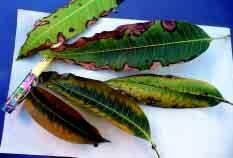 Leaf symptoms that may point to deficiencies of specific nutrients. Organic fertilisers are materials derived from plant and animal droppings such as weed residues, tree prunings, urine, green manure, farmyard manure, crop residues, and others. These are used to fertilise the soil. Also grazing livestock play an important role in nutrient flow to cropland. Plants contain three substances that define their quality as organic fertiliser: Nitrogen, Phenols and Lignin. All plants need nitrogen to grow. They get it from the soil and/or from the air and store it in their leaves stems and roots. Some plants are good in taking up nitrogen and are valuable organic material or intercrops as they increase the nitrogen amount in the soil. These include legumes such as beans, chickpeas, sesbania, leucaena and many others (see section on green manure). Other plants, e.g. maize, are not so good in taking up nitrogen. 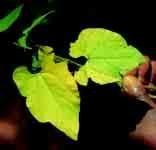 Plants with yellowish leaves, have little nitrogen and are poor organic fertiliser. Phenols are substances in the plants that make them rot slowly. A plant with a lot of phenols will make low-quality fertiliser. Different parts of plants contain different quantities of phenols. If the stems contain a lot of phenols and the leaves less, then is better to use only the leaves as fertiliser. When plants die, some rot quickly and release the nutrients into the soil within a short time, others rot slowly. Plants that are woody contain a lot of the substance lignin, which makes them rot more slowly. Plants that rot quickly make generally better organic fertiliser, as the crops can use their nutrients sooner. So, plants containing a lot of lignin rot more slowly and make a poor organic fertiliser. Step 3: Harvesting. In two weeks the worms have grown and multiplied. The big worms can be harvested by sieving them with a wire mesh. Place them in a separate container for use according to the desired purpose. Vermicomposting is the use of earthworms to transform organic materials into rich, organic fertilisers. They accelerate the composting process and the addition of this compost to the soil, results in improved chemical, biological and physical properties and better conditions for plant growth. The tiger worm (Eisenia foetida). This is the most commonly used species in commercial vermiculture and waste reduction. This species is raised in Kenya by several flower farms in the Central Highlands and Rift Valley. Kenyan highland forest pigmented earthworm. A not yet identified earthworm was recovered by the author (Mr. Canon E.N. Savala) from highland forest litter near Muguga, Kenya. It produces finer vermicomposts than E. foetida but the chemical composition is comparable). African night crawler (Eudrilus eugeniae). This is a large prolific African worm that is cultured in the U.S. and elsewhere. It is somewhat difficult to raise because of its intolerance to low temperature and handling. The use of E. eugeniae in outdoor vermiculture is limited to tropical and sub-tropical regions because it prefers warmer temperatures and cannot tolerate extended periods below 16degC. Perionyx excavatus. This is a species well adapted to vermicomposting in the tropics. The earthworm is extremely prolific and easy to handle and harvest but it cannot tolerate temperatures below 5degC, making it more suited to the tropics. Dendrobaena veneta. A large worm with potential to be used in vermiculture and that can also inhabit soils. It has a slow growth rate and the least suitable species for rapid organic matter breakdown. Polypheretima elongata. The species is suited for use in reduction of organic solids, municipal and slaughterhouse waste, human waste and poultry and dairy manure but it is not widely available. It is restricted to tropical regions, and may not survive temperate winters. The production of vermicompost requires from three to six months. Step 1. Construct the bed. Prepare a bed with a concrete, wood or plastic sheet bottom and construct walls 20 to 30 cm in height using wood, logs or stone. Place a wooden board across the bottom and line with chicken wire for better handling and aeration. Step 2. Add coarse material. Place a 10 to 15 cm layer of coarse organic materials such as banana trash, maize stover, coffee husks and other crop residues on top of the chicken wire. The material must not contain poultry manure as this is harmful to worms. Step 3. Add fine material and water. Place a 5 to 10 cm layer of manure on top of the coarse material. Cattle, pig, sheep or goat manure are suitable. Green manure, such as tree leaves or grass cuttings may be substituted. Mix some of the fine material with the coarse layer. Mixtures of fine materials such as grass cuttings, bean threshing, maize or wheat bran and brewery waste are preferable. If the fine material is available in short supply, then use it to surround specific areas where earthworms are released. Moisten the organic materials prior to the introduction of the worms. Sufficient water should be applied so that no pockets of dried material remain. Wet materials such as banana trash and fresh manure need little watering while dried materials may require as much as 30 liters of water per m2 of bed. Step 4. Release worms. Release the earthworms into the moist bed. Avoid handling individual worms, rather place small handfuls of material rich in earthworms (clusters) into 'holes' spaced about 0.5 m apart. Step 5. Cover the bed. Cover the bed with banana leaves or dark polythene plastic. Inspect the bed regularly during composting for moisture and the presence of predators. Ants will usually leave the bed if the underlying chicken wire is violently and repeatedly shaken. Add new layers of banana leaves occasionally as the worms consume older leaves. Step 6. Feed the bed. Organic materials may be applied to the bed regularly as additional layers or in discrete locations. A common practice is to periodically apply additional organic wastes by burying them in different positions within the bed. Vermicompost is ready after three to six months. Additional feeding prolongs the vermicomposting process but yields larger amounts of vermicompost. Withhold feed about three weeks before the vermicompost is collected to obtain a finer and more homogeneous and finished product. Step 7. Recover worms and vermicompost. When the vermicompost is ready, worms are harvested and compost processed. Place a fine feed material on the bed prior to vermicompost harvesting to facilitate the collection of worms from subsequent 'batches'. Wheat bran, brewers' waste or fresh cattle manure are particularly good feeds that lure earthworms. Collected worms may also be fed to fish and poultry. Spread vermicompost in the sun to collect other pockets of worms by hand as the vermicompost dries. Once worms are collected, the vermicomposting cycle may be repeated. The finished vermicompost is uniform, dark and fine textured. It is best used as the main ingredient in a seedling or potting medium after passing it through a 5 or 10 mm mesh. A typical nutrient content from a manure-based vermicompost using E. foetida is 1.9% N, 0.3% P and 2.7% K.
For soils to be productive, they must be in the optimum pH range. A pH range of 5.5 to 6.5 is satisfactory for moderate yields of most crops. Though, for high yields, the optimum pH values/ ranges differ for different soils and crops. Values under pH 4.5 to 5.0 (acid) can severely damage the plants by causing nutrient deficiencies (e.g of P, Mg, etc) and toxicities (of Al. Mn, Fe). To neutralise soil acidity, lime must be applied. How to know if the soil is acid? When must lime be applied and how often? Note: Beware of applying too much lime! If soils are too alkaline, nutrients such as iron, manganese, zinc and phosphorus become inaccessible to crops. Dolomitic lime includes equal quantities of calcium and magnesium carbonate (CACO3 + MgCO3) and should be used on acid soils with a magnesium deficiency. Promotes the activity of earthworms and nitrogen-fixing bacteria as well as the rotting of organic material that releases nitrogen, phosphorus, sulphur and micro-elements. Gachene, C.K.K. and Kimaru, G. (2003). Soil Fertility and Land Productivity - A guide for extension workers in the eastern Africa region. Technical Handbook No.30. 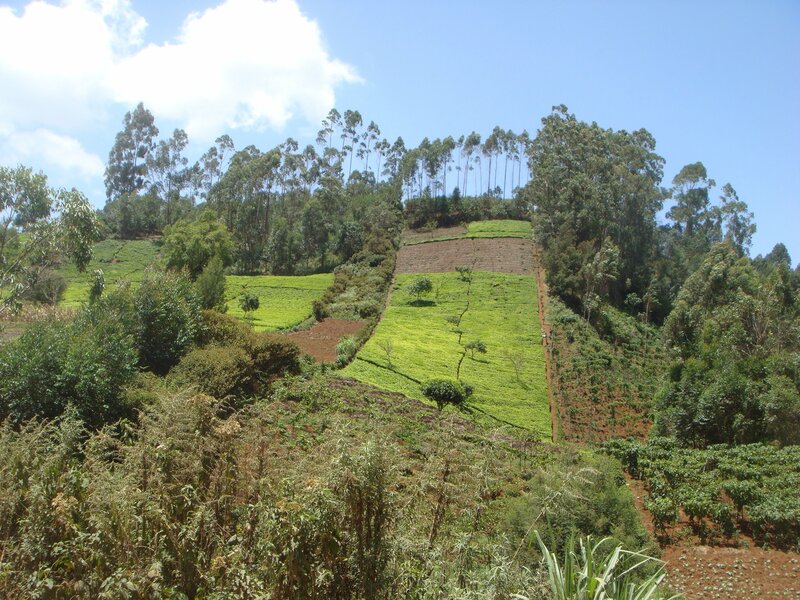 Regional Land Management Unit (RELMA) / Swedish International Development Cooperation Agency (Sida). ISBN: 9966-896-66-X. Russel, E.W. (1973). Soil Conditions and Plant Growth. 10th Edition. Longman Group Limited, London.